Jewish Theological Seminary (JTS), a school with a long history of being committed to social justice issues, views the current environmental crisis as the civil rights issue of our time. This commitment to environmental issues reinforces the core goals of JTS, such as cultivating Jewish leadership, community engagement, and tikkun olam. JTS’s Gendler Grapevine Project grant will support the JTS Green Team Terrace Garden and Eco-Sanctuary. This project will result in developing a physical space, reaching out to the New York community, creating educational programming, and providing hands-on opportunities for students. 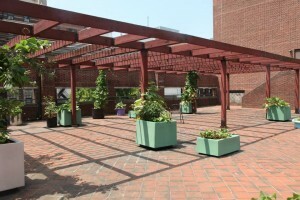 The rooftop garden, which will serve as the site for the Eco-Sanctuary, will be overhauled to become a more functional resource for fostering environmental awareness and practice in the JTS community. This space will also serve as a substantive Jewish learning tool. Permanent wooden raised beds carved with Jewish symbolism, along with benches and plaques that speak to the spiritual nourishment fostered by interacting with the environment, will transform the space into a functional and more usable space. The community will tend the garden, harvest its bounty, and donate its extra fruits to the Morningside Heights community. In addition to the physical garden space, JTS will provide internship opportunities to students who will help establish the new garden. The school will also create environmental education programming such as holiday tie-ins and an Earth Day celebration to connect Jewish learning with practical knowledge about the environment, food ethics, and sustainability. 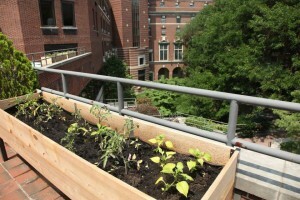 Finally, JTS will expand their composting program to all of the residence halls, which will support the rooftop garden.